I’ve never been big on coffee or hot tea, but let me tell you, the past 2 months, this stuff has kept me going! There’s something about a hot “cuppa” (as they say in other parts of the world) that helps waken the brain and get the creative juices flowin’. I still think Starbucks is ridiculously overrated and overpriced and it can’t compete with the Kona coffee I had in Hawaii and the naturally sweet coffee Mike brought back from Costa Rica! 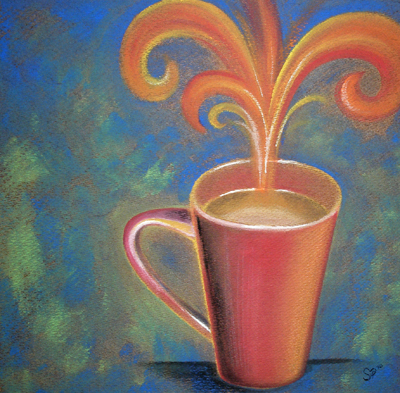 Somewhere out there a little coffee shop is wishing this painting was drawing in more customers for a ‘cuppa joe:!